Progress on the new grooming room is slow. I had one day where things kinda just flowed and things got done. I was up on ladders, using my arms and head to hold up sheets of MDF to the ceiling and using the nail gun to secure them there. Then I ran out of MDF. Turns out I’d measured correctly but remembered wrong. I needed 6 sheets (of the biggest size I could handle on my own) but remembered to buy 4. Live and learn my friends. So, having NOT finished the ceiling I couldn’t very well finish everything else. I had one and a half walls I could put ‘skirting boards’ and ‘cornices’ on. I placed those words in quotation marks cause I’m not using either cornice or skirting boards for the job. I got plain pine boards cause it was the cheapest way to go. The end result is the same: I’m covering gaps where walls meet ceiling or walls. Ok. I didn’t find the gate. I found the gate was a job I could do which wasn’t affected by the unfinishedness of the ceiling. I had planned to use pallet wood to make the gate, but I had 2 long pieces of old tassie oak flooring outside the grooming room, in the tiny yard, just waiting for a use. So I used them. Firstly I had to measure the distance between the cement slabs the casita and the tiny shed (its an aviary) are sitting on, then the distance between the walls. I’d already attached an extra post to the one on the side of the casita which holds up the porch roof so I could swing the gate off it. I cut my timber pieces the height I wanted – tall enough to stop a dog jumping over them. Then I did what any sane, mathematically challenged person would do: I marked the measurments out on the floor and lay the timber down, spacing the boards by eye and laying the cross pieces over the top. Good enough for me. I joined all the boards together using screws then reinforced those with nails. I cut my Z pieces. I did two cause I couldn’t work out the angle to cut a single one on… I did say I was mathematically challenged! In order to save wastage I went with 45 degree angles and 2 Z pieces. It should work fine. 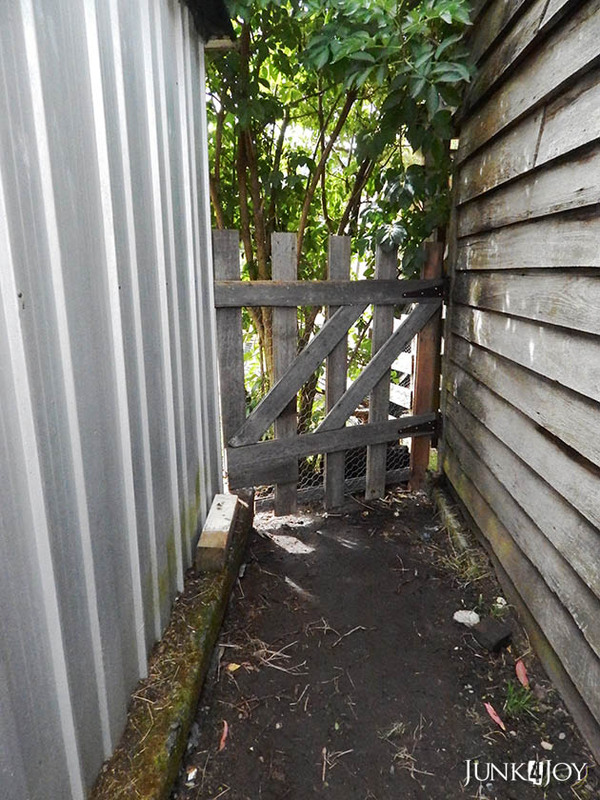 Last I used some nice strong chicken wire over the back of the gate cause the gaps are big enough to allow dogs through. I had wanted a picket style gate with small gaps but I didn’t want to spend money on treated pine or fence pickets. This is one heavy gate cause tassie oak is heavy stuff. I had to get some pretty strong hinges from Wayne’s collection of rusty items to hang them with. I love my new rustic gate. It fits between the wall of the casita and the aviary and will stop dogs from escaping into the paddocks. I’ll be putting a bolt onto the gate at #1, put a hole into the aviary wall for the bolt to slide into. 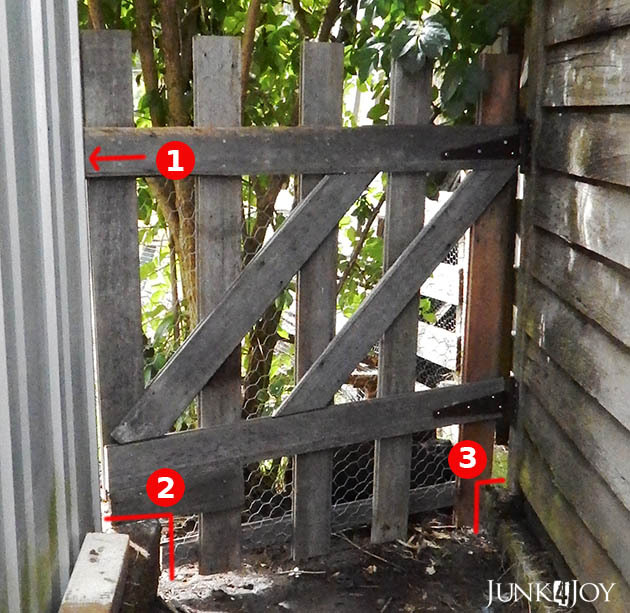 #3 is where a sliver of wood was removed to allow the gate to swing without hitting the concrete on the casita side. I’ll finish this post with a gratuitous photo of a poodle: Romeo was overseeing my gate-building efforts. He approves. 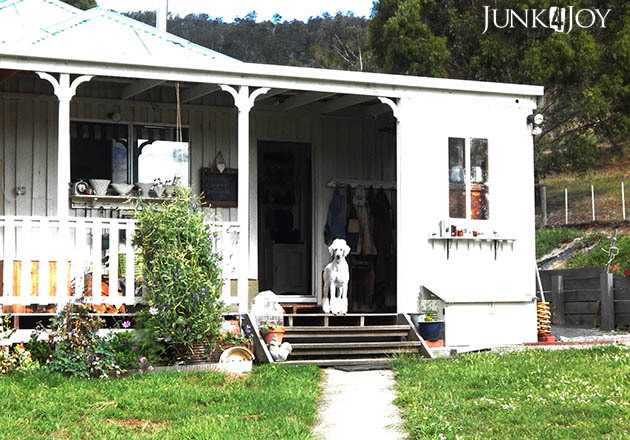 This entry was posted in DIY, life on the farm, recycling, Renovating, rustic by zefiart. Bookmark the permalink.